Bring some shade to your business with the Galtech 6-ft. Square Aluminum Commercial Market Umbrella. This umbrella is designed with style and simplicity to meet the demands of your commercial application - or for real peace of mind using it season after season on your own personal patio. 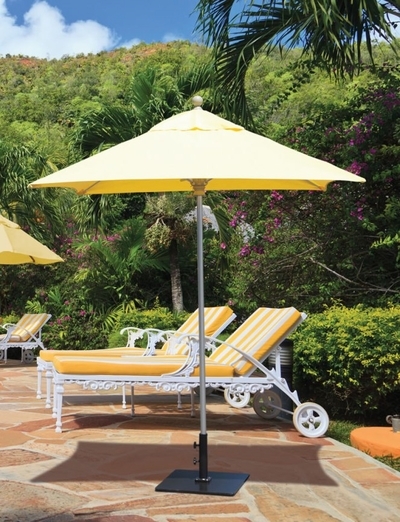 This umbrella has an upscale sleek appearance and its single pole makes it especially sturdy and durable. The simple manual lift raises with ease and a pin simply locks the canopy in position. This umbrella features fiberglass ribs which allow for more flexibility ensuring your outdoor umbrella can handle even the harshest weather conditions. A variety of fade-resistant fabrics are available and one of them is sure to work beautifully with your commercial space. This is a must have addition to your open-air space that is as delightful as it is functional. * Shade Size: 6' x 6' ft.